MSF is providing care, including mental health care, to patients in Pakistan's Lower Dir province, where the security situation remains volatile. “I still remember there was a big bomb blast in April 2010, about 300 meters [about 984 feet] away from our hospital. Within a few minutes, dozens of injured patients were already outside the emergency room. We needed to quickly identify who needed to be attended first,” recalls Dr. Muhammad Zaher, who is working with Doctors Without Borders/Médecins Sans Frontières (MSF) as assistant medical focal person in Timergara, in the Lower Dir district of northwestern Pakistan’s Khyber Pakhtunkhwa (KPK) province. Until a few years ago, Lower Dir, on the border with Afghanistan and the tribal areas of Pakistan, was the scene of fighting between the military and armed opposition groups. The security situation in the area remains volatile, and bomb blasts, clashes, and targeted killings still take place today. MSF has been supporting the District Headquarter (DHQ) hospital in Timergara since 2009. The team has implemented a new routine triage system in the emergency department, and has also developed a plan to deal with the arrival of many people in need of emergency care. Handling such incidents is a race against time. The mass casualty plan allows medical staff to rapidly identify and prioritize patients’ medical needs based on a few vital signs. Patients are then categorized: “green” means the patient is stable and can wait for few hours; “yellow” means he or she can wait for an hour; “red” means lifesaving treatment is required within one minute; and “black” means deceased or beyond help. “Red” patients are immediately sent to the resuscitation room. “This allows us to provide good quality medical care to a maximum number of patients, and save a maximum of lives within a minimum of time,” says Dr. Zaher. A routine triage system, using the South African Triage Score (SATS), has also been implemented to improve day-to-day patient care in the emergency department. Upon arrival, every patient receives an initial screening, in which staff measure blood pressure, heart rate, and clinical conditions to help prioritize patients’ medical needs. In the first three months of 2012, a total of 12,162 patients passed through the triage system, and 3,271 patients were treated in the resuscitation room. * The patient’s name has been changed to protect his anonymity. There is a serious lack of good-quality specialized health care in Lower Dir, and MSF also provides emergency surgery in Timergara for patients from all over the district. Most patients in a serious condition are referred to the DHQ hospital, while some are sent as far as neighboring districts, such as Upper Dir and Bajaur Agency. “I got shot by my business partner. I was in a hilly area bordering with Afghanistan. The road was rough. I was put on a bed carried by people for an hour and then was sent to nearest Samar Bagh Tehsil hospital by car for another hour. Having given me IV [intravenous] fluids, they referred me here,” says Anwar [patient’s name changed to protect anonymity], who had emergency surgery in Timergara’s DHQ hospital to remove the bullet and shrapnel in his groin and is now receiving post-operative care. “We borrowed 5,000 PKR [about $54] from the doctor in Samar Bagh hospital. We thought we would need to pay for the surgery here. We are glad that it’s free of charge. Otherwise, even if we sold our house and all the cattle, we would still not have enough money to pay for it,” says Anwar’s uncle. MSF currently supports the emergency department, emergency surgery, and the mother-and-child department in the DHQ hospital in Timergara. Mental health care is also provided to patients in these departments. All medical care provided by MSF is free of charge. Mental health services are scarce in Pakistan, and Lower Dir is no exception. There are very few psychologists for the district’s estimated population of 1.2 million people. Indeed, the MSF team in Lower Dir knows of only one. The volatile security situation in Lower Dir is affecting many people. Some have difficulty coping with the psychosocial consequences of violence. There are people suffering from post-traumatic stress, while others face chronic everyday stress for which their usual coping mechanisms are no longer sufficient. In the emergency department at Timergara DHQ hospital, MSF staff has seen patients whose medical problems are in fact related to mental health issues. A number of people come in after attempting suicide, and many are emotionally agitated or in a depressive condition. In response to this situation, MSF started providing mental health counseling and psychosocial support in the hospital in February 2012. The mental health team is made up of both male and female staff. They provide individual and group counseling to patients referred from the mother-and-child health department, the emergency department, and the post-operative wards. At the end of May, MSF had conducted 444 individual mental health sessions and 30 group psychosocial sessions. 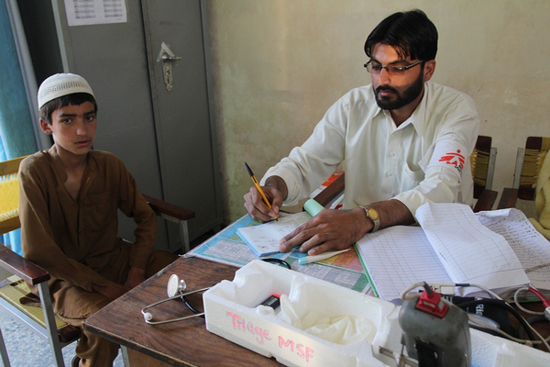 MSF has been working in Pakistan since 1986. Apart from Timergara, MSF is working in Dargai, Hangu, and Peshawar in KPK province. MSF also has projects in Quetta, Kuchlak, Dera Murad Jamali, and Chaman in Balochistan province; as well as Kurram Agency in the Federally Administered Tribal Areas. A project in Karachi, Sindh province, is going to open later this year. For all its activities in Pakistan, MSF relies solely on private donations from individuals around the world and does not accept funding from any government, donor agency, or from any military or politically-affiliated groups.